This pair of earrings is made from a single emerald (once part of a pair of earrings) and a sapphire cabochon which was once a pinky ring. 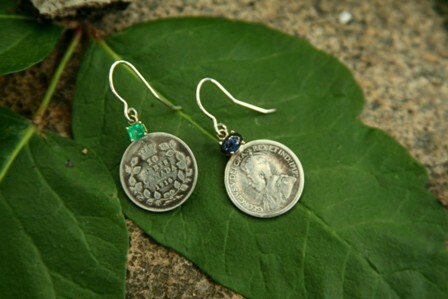 The coins are early 20th century and the wires are handmade from recycled sterling. They can just as easily be two separate pendants on chains. I love the idea of quality jewels no matter the size as they are always worth remaking down the road. I must admit that this is nothing new for me…I was busted turning my mom’s presidential silver spoon collection into bracelets back in the 70’s. The JFK spoon was my favorite. I still occasionally turn a piece of random sterling flatware into a ring. These tourmaline cabochons and slices were from three old tourmaline crystals in a collection given to me by a boyfriend. I didn’t learn to slice and cut them for a couple of years after I received them. A couple of them are drilled and now employed as pendants. The tourmalines were from Maine, USA.They were mined many many years ago so I am not impacting the environment today which adds to their beauty. 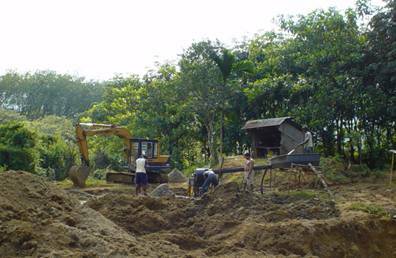 As you can see mining even in a primitive way disrupts the natural landscape in ways that are rarely if ever reversed. This is my small contribution to the land which has given us so many gems and with the advent of the shopping channels has been scraped, dug, and tunneled to provide even low grade commercial stones so that every price point from Walmart on up is covered. By using antique and mid century Italian coral instead on newly harvested I am not part of the problematic issue of over consumption of precious corals. This dependence on vintage and previously manufactured has its limits on being able to produce commercial quantities of my art and frankly I am A-OK with that. One of a kind has always been my niche and small collections based on some locally sourced vintage beads or gems makes my creative process stretch and grow in ways that having a mainstream supply does not. This is another reason I recycle. I am not interested in low grade gems. 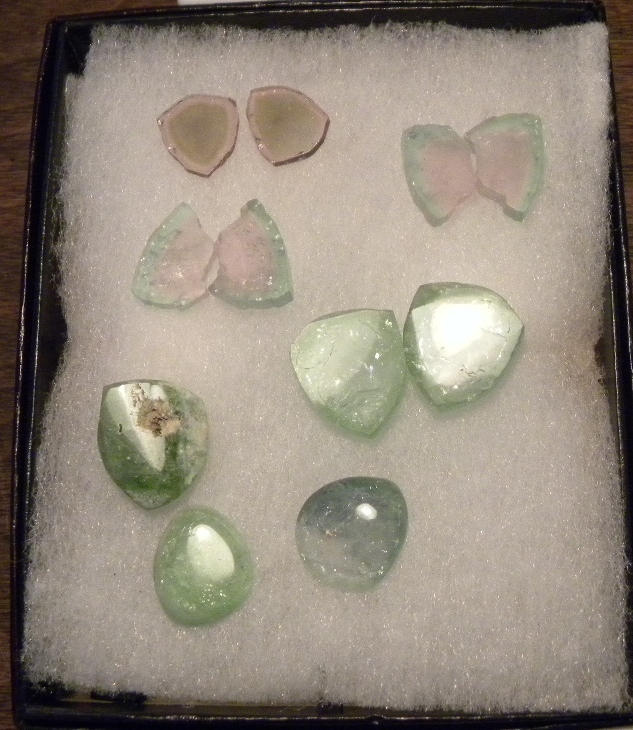 I try to work with quality even if small gems and rarely use gems which are irradiated or dyed or stabilized. 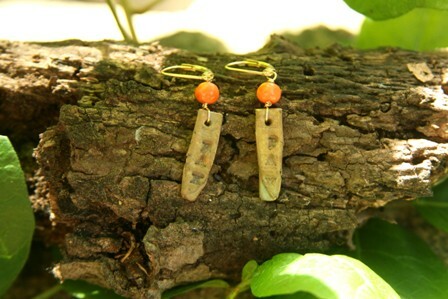 I love jewelry and all that it stands for so it is important to me that my jewelry share my ethics of respecting the planet and the humans who inhabit this planet. Jewelry means many things from religious or spiritual beliefs to love, affection, ancestry and as a symbol of wealth, fashion, style and energy. Respecting the process means respecting those meanings which people assign to their gems and jewels. Ask where your jewelry comes from and why?